Yet today, Trotter’s name has little recognition even with knowledgeable art connoisseurs. Despite her skill and Ruskin’s encouragement, Trotter did not believe that art was the true calling for her life’s work, but rather that God was beckoning her to serve as a missionary in North Africa. This became the defining decision of Trotter’s life; to move away from a life of art and leisure in order to devote her life to her work in Algeria. Nevertheless, artistic interests never truly left Trotter’s life, as everyday for 40 years in her journals Trotter recorded her deepest thoughts through words and watercolors. Five of those journals by Lilias Trotter were brought to The Center for conservation, digital archiving, and reproduction back in 2013. 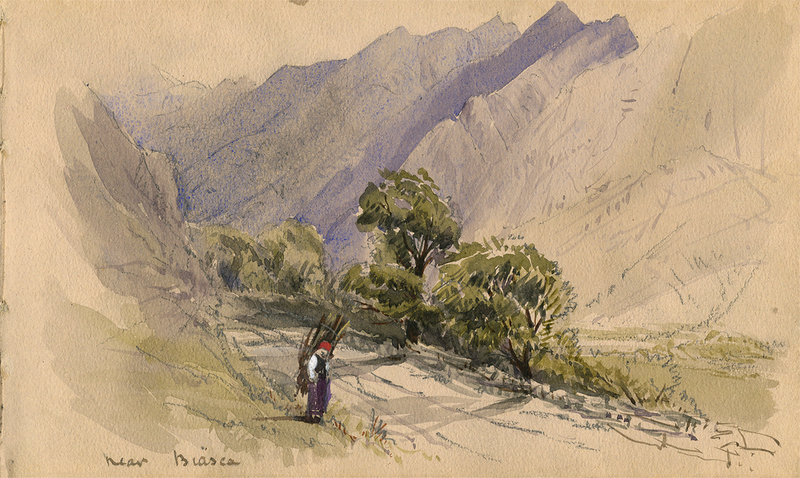 Some of the journals were sketch books, while others were written accounts of her experience in Algeria alongside pencil and watercolor sketches, as well as photographs of daily life there. Laura Berenger, Conservator of Rare Books, and Robin Hann, Photographer and Archivist, joined forces for this project. Laura shares her experience working with the journals: “One of my first thoughts in paging through the Lilias Trotter journals was, ‘These may be the most exquisite pieces I have the chance to work on. The Islamic-inspired leather covers with simple geometric blind tooling protecting the words, photos, and paintings of such a gifted woman were unlike anything I had seen first-hand before. Travels and work that, to me, seem beyond daring are married with the most intimate and refined artwork—paintings that are spontaneous, contemplative, delicate, and majestic. These are the kinds of books that leave me in a state of awe that my hand is touching the same page as the hand that created the masterpieces.” We encourage you revisit our article, “Lilias Trotter: Missionary, Artist” to read more about the preservation of these beautiful journals. A new documentary exploring the life of Lilias Trotter, Many Beautiful Things featuring Michelle Dockery (Downton Abbey) and John Rhys-Davies (Lord of the Rings) takes viewers on the journey of this prodigious, self-taught young female artist who finds herself torn between two desires—to strengthen her flourishing artistic talents or pursue a higher calling to serve marginalized women and children in North Africa. Through dazzling animation and cinematography featuring original works by Trotter, the film awakens viewers to question the limits of sacrifice and the true meaning of success. Trotter’s history is shared through the eyes of Miriam Rockness, a self-made scholar in her early 70s who has become the world's leading expert on the artist-turned-missionary after nearly 30 years of research. In conjunction with International Women's Day on March 8, Many Beautiful Things was made available for download and purchase on DVD. Visit www.ManyBeautifulThings.com to learn more about the film, download, or find screenings around the country.